John Ing: "Gold's Bull Market Intact"
Unfortunately governments today wallow in the hypocrisy of politics, particularly when it suits them. America’s foreign policy is symptomatic of this hypocrisy from branding Egypt’s coup d’état as a “change in government” to the repeated bending of Mr. Obama’s “line in the sand”. Or then there was big brother’s NSA spying on everyone including America’s allies but spying was considered not as bad as Edward Snowden’s crime of “leaking” the information to the media. Then there was the Internal Revenue Services’ targeting of conservative groups because of their political leanings and not their tax status. Or how about the West’s invasion of Iraq in pursuit of weapons of mass destruction which were found to be non-existent. That shadow loomed again as the US was about to launch air strikes against Syria, not for regime change nor to destroy their cache of chemical weapons but simply to teach that country a lesson. Obama and his team certainly lost credibility, turning a “commander-in-chief” opportunity into another unseemly political episode exposing a dysfunctional political system. “I know that an invasion of Iraq without a clear rationale and without strong international support will only fan the flames of the Middle East, and encourage the worst, rather than best, impulses of the Arab world, and strengthen the recruitment arm of al-Qaeda. I am not opposed to all wars. I’m opposed to dumb wars. So for those of us who seek a more just and secure world for our children, let us send a clear message to the president.” ~ State Senator Barack H. Obama, October 2002. And five years after the US financial banking system meltdown, the new safeguards were watered-down with the banks becoming even bigger, making the system ripe for abuse by those same players that almost brought the system down. Or, how about the much talked about Obamacare which was introduced so that all Americans could receive medical care under the “Affordable Care Act” and for those who can’t, subsidies, which included the members of Congress and their staff. What hypocrisy. After a five year spending binge and trillions of newly created debt from rounds of quantitative easing, there is an unwanted side-effect. July’s deficit was $148 billion and the Fed’s balance sheet has expanded at the expense of the private sector inflating asset prices instead of the economy. As a result, Wall Street has fared better than Main Street. However, the long awaited plan to reduce the Fed’s purchases of America’s debt brought not relief but angst among governments, investors and now the Fed is addicted to ultra-cheap money. The Fed has bought $2.8 trillion of new debt in the past five years and over the same period, foreign investors have bought $2.3 trillion of American debt of which the Chinese own $1.3 trillion of US Treasuries. The Fed continues to buy Treasuries with dollars it mints for that purpose and to date has bought up to 70 percent of net issuances. Debt on debt is not good. Since the collapse in 1971 of the old fixed exchange rate system under Bretton Woods, the world has been using the dollar as the international reserve currency. While each country has control over their money and interest rates, the benchmark remains the US dollar. However, in the past dozen years, the US federal monetary policy has been the world’s defacto monetary policy, a form of financial protectionism. The dilemma for each country other than the United States is that a “made in Washington” policy is not necessarily, Beijing’s or Brazil’s policy. The US Federal Reserve has flooded the emerging markets with dollars. However, with the slowdown, many emerging countries have seen their currencies drop against the dollar, causing them to purchase their currencies in a support arrangement. Emerging markets now make up over half of the world’s GDP and what they do with their currencies or the US dollar has international ramifications. For example, the coming showdown over debt could lead to a government shutdown and a collapse of the dollar when those dollars come home to roost. The big risk is that the emerging countries, in order to protect their currencies will wash their hands on America and Mr. Bernanke’s successor will have to live with the consequences. 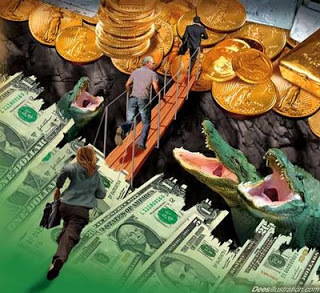 After all, America is the world’s largest debtor and the emerging markets are the largest creditor and in diversifying their holdings into gold for example, they are only defending their purchasing power. China too is making a major adjustment. In warp speed fashion, it has loosened controls around the renminbi, moving the renminbi to the top 10 currencies and there is talk of backing the renminbi with a little gold. China is the world’s largest gold producer and this year will prove to be the largest gold consumer, surpassing India. The financial crisis gave China a vivid lesson depending on another country for its reserve currency. The Chinese have a problem with what to do with their outsized $3.5 trillion of foreign exchange reserves. They are big holders of US Treasuries but will suffer big losses when the Fed exits the market. China has hedged their bets and diversified. It has been reported that they have been adding to their 1,000 tonnes of gold, which represents less than two percent of their reserves. Even if China were to buy the next three years of total world output they would have less 10 percent of their reserves in gold, the average of most Western central banks. Central banks hold a little more than 30,000 metric tons of gold or less than twenty percent of the above ground gold stocks. United States is the largest holder at 8,000 tonnes with the IMF, Switzerland and now the Russians hold more than a thousand tonnes of gold. China, Russia, Kyrgyzstan, and Turkey are buying gold with their excess dollars. Gold is an alternative investment to the dollar for these central banks. Change is coming. A stable international system has alluded the world since the end of the gold standard. Perhaps the solution is back to the future. Gold is the default currency. The Fed’s blinking on tapering was due to their concern over the uptick in interest rates following Mr. Bernanke’s musings in June. While the markets soared on his back-peddling there are reasons to worry. The economy is still weak despite trillions of stimuli. Today even the Fed is addicted to low interest rates. And coming soon are the negotiations between the White House and Congress which could trigger a Federal shutdown next month. Ironically, none of this is going to give the economy a boost. We believe that America botched the “exit” partly because nobody has tried it on this scale before. In fact, while long term interest rates rose, they are still negative suggesting monetary conditions are still too loose despite the rhetoric of “tapering”. After three rounds of quantitative easing, itself an untested innovation, the end goal is no longer an improvement in the “labour market” but simply a “better set of data”. Mr. Bernanke’s red line looks like Mr. Obama’s. It would be hard to trust this central banker or his successor. Instead there is going to be more volatility and a revaluation of risk. Ominously, money has already left. According to the US Treasury Department, there was a record $40.8 billion of net foreign selling of Treasuries in June, for the fifth straight month. Investor confidence is fragile. The repeated crossing of red lines has undermined America’s credibility. That will be good for gold and bad for the dollar. We have a lame-duck presidency, lame-duck Fed and a lame-duck economic recovery. ← Has America Been Set Up As History’s Ultimate Bumbling Villain?